Blaine Yorgason was born in Sanpete County, Utah on December 6, 1942. A novelist, he has also written biographies. He is one of the most popular authors ever to write for the Latter-day Saint fiction market. He graduated from Brigham Young High School in the Class of 1961. He played football and was active in dramatics. As an author, Brent is a frequent collaborator with his brother, Brent Yorgason, BYH Class of 1963. Blaine served an LDS mission in Chicago. He married Kathleen Wagstaff of Orem, Utah on September 2, 1964. He graduated from Brigham Young University with a BA in History and an MA in History. 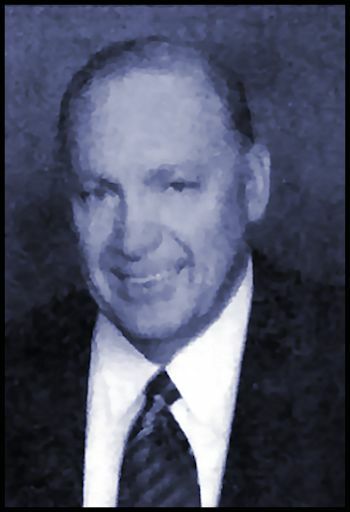 He served as an LDS Seminary Instructor from 1970-1977 and taught at BYU from 1977-1980. Since 1980, Blaine has been a full-time writer. He has published more than 70 works, and to date, two of his books have been made into films. Blaine has been honored with many awards including Best Screenwriting Award and Excellence In Writing Award. Blaine and his wife Kathleen have seven children and 20 grandchildren. They have lived in Riverton, Utah, and in St. George, Utah. His parents were John Gayle Yorgason and Lucretia Maude Copley Yorgason of Fountain Green, Utah. Chester, I Love You was written with his brother Brent Yorgason, and it was adapted for film as The Thanksgiving Promise, which was released by Disney Productions. The screenplay was co-written by Glenn L. Anderson, Craig Holyoak, and Peter N. Johnson. It was directed by Beau Bridges, who also starred. Some of the following books were co-authored. Co-authors include: Brenton Yorgason, Carl Eaton, Tami Yorgason, Sunny Oaks, Richard Schmutz, and Douglas Alder. 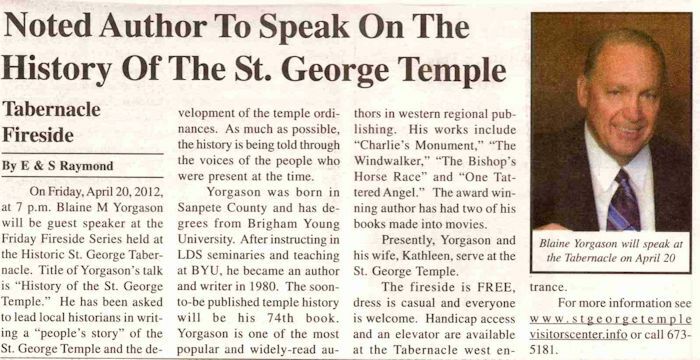 All That Was Promised: The St. George Temple and the Unfolding of the Restoration (2013) with Richard A. Schmutz and Douglas D. Alder.